(Wallingford, CT, December 26, 2018) – Kovacs Machine & Tool Co. today announced they have successfully completed major IT systems and Infrastructure upgrades across all areas of the organization. “Upgrading our corporate network with the latest hardware and software was paramount to ensuring that we continue to meet our customers’ growing needs and to provide building blocks for many years to come. Additionally, we have deployed advanced security measures as well as strengthened our disaster recovery plan” said Peter Albrycht, of Kovacs Machine & Tool. Kovacs Machine & Tool Co. is solely owned and operated by SIMSON Corporation. 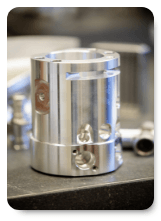 Kovacs Machine & Tool Co. is a preferred OEM supplier of precision-machined components for some of the industry’s largest customers. The company’s proven approach, coupled with turnkey solutions, helps customers bring their parts from the engineering table to market efficiently and cost-effectively. Kovacs Machine & Tool Co.
(Wallingford, CT, August 22, 2018) – Kovacs Machine & Tool Co. today announced they have been awarded the ISO 9001:2015 Quality Standard Certificate. ISO 9001:2015 is the international standard that mandates specific requirements be met for a quality management system (QMS). By meeting the extensive criteria for this standard, Kovacs Machine & Tool affirms its ability to consistently deliver quality products and services to its customers. “Our team is incredibly proud to be recognized for their hard work in producing products with quality in mind, and continuously looking for ways to improve our processes,” according to Cuccaro.